Narasimha, the fourth incarnation of God Vishnu, is half-human half-lion and provides a very fascinating study of the Lord's incarnation in order to alleviate the sufferings of his devotees. Sage Kashyap had four wives, Diti, Aditi, Vinita and Kudroo. Diti gave birth to demons and from Aditi were born gods, while from Vinita was born Garud, the carrier of Vishnu and the last one Kudroo created the hydras. Dithi gave birth to Hiranyaksha and Hiranyakashipu. Vishnu killed Hiranyaksha as he oppressed the devas. At the death of Hiranyaksha, Hiranyakashipu was overpowered with grief. His mother Dithi was heart-broken. Hiranyakashipu also was filled with sorrow and it burnt his own heart like fire. He hated Vishnu and Vishnu's very name was like poison to him. His blood was boiling with the hatred of Vishnu. Hiranyakashipu had a son named Prahalad. Right from his very childhood Prahalad was attracted towards Vishnu and the other gods. Prahalad had not obeyed the orders of his father not to worship Vishnu. His father tried to destroy his son in a fit of anger; tying a stone to Prahalad's body, he was thrown into the river but Vishnu himself stopped him from drowning. Hiranyakashipu later tried to get Prahalad trampled under the feet of an elephant but the elephant lifted Prahalad lovingly by the help of his trunk and put him on its back. He then built a house and put Prahalad into it and set the same to fire; even this could not harm Prahalad. The father even tried to poison the son, but to no avail. There was Sri Hari, in the form of Narasimha. He had the head of a lion and the body of a man. (Nara = Man : Simham = Lion). The eyes of this terrible figure were dazzling and they looked like molten gold. The hair on the head and the moustache and the beard stood straight and erect. The sharp and pointed jaws chattered harshly; the tongue quivered like a sword and was sharp as a dagger. His eyebrows were close knit. The ears were raised and stood erect. The mouth gaped like a mountain cave. The two nostrils looked like wells turned upside down. The body was huge and mountain-like. It seemed to touch the skies and to stop the very clouds. It had countless arms. The body was covered with a white substance like silver. The very sight of the sharp claws made one tremble. This terrible form split the pillar and came out. Hiranyakashipu's courtiers had crowded the hall; but not one dared to look at him, not to speak of ever approaching him. Narasimha caught Hiranyakashipu with a loud roar and carried him to the threshold of the hall. He sat on the threshold with the Rakshasa in his lap. Then he dug his nails deep into his body and tore it open. He took out the entrails and wore them round his neck. Thus the wicked asura was finally killed at the hands of the man-lion, Vishnu. All the asura bodyguards who fell on Narasimha in fierce rage were crushed into a lump of flesh in the winking of an eye. After the enemies were destroyed, Narahari (Vishnu) sat on the throne of the Rakshasa King, glaring at those around him. The gods showered flowers from heaven. The Gandharva sang divine music and the Apsaras, the dancers of heaven, danced in joy. The entire earth rejoiced. The gods praised Vishnu's ways. "Hiranyakashipu got boons from Lord Brahma; and Narasimha has respected all the promises. For it is now twilight, which is neither day nor night; the place is neither outside the house nor inside it, it is the threshold. Again he was killed neither on land nor in the sky, but on the lap of the god; he was killed neither by weapons nor by missiles but torn by nails; no one created by Brahma has killed him nor was he born in the wombs by ordinary course; it is Vishnu, in the form of Narasimha, who slew him. The little boy Prahalad touched the feet of Narasimha with his head in deep devotion. At the tender touch of Prahalad the Lord was pleased. He grew calm and anger gave way to kindness. Vishnu gave his blessings to Prahalad - the true devotee. Please eat once on the previous day (Trayodashi) and on the Narasimha Jayanthi day keep fast from morning till chaturdashi tithi ends. After sunset, perform Pooja to Lord Narasimha. Please keep night vigil. Perform visarjan pooja next day morning. If chaturdasi prevails more than 3 prahara break fast before noon next day. If possible do 'teel patra dana' to brahmin. After taking a bath do Lord Narasimha pooja with abhishekam, and perform homam to Lord Narasimha. 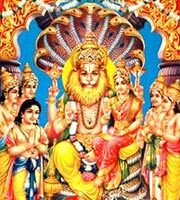 Perform Punchasukta homam, Narasimha moola mantra homam, Sri Lakshmi-Narasimha mantra homam. Additionaly one can add Sri Sudarshan homam as well. Please visit the hindu temple in your area where these ceremonies are performed and take blessings of Lord Narasimha. Most temples perform Lakshi-Narasimha Sudarshan homam on this day. Certain temples celebrate this festivals for nine days starting from shasthi till chaturdashi.